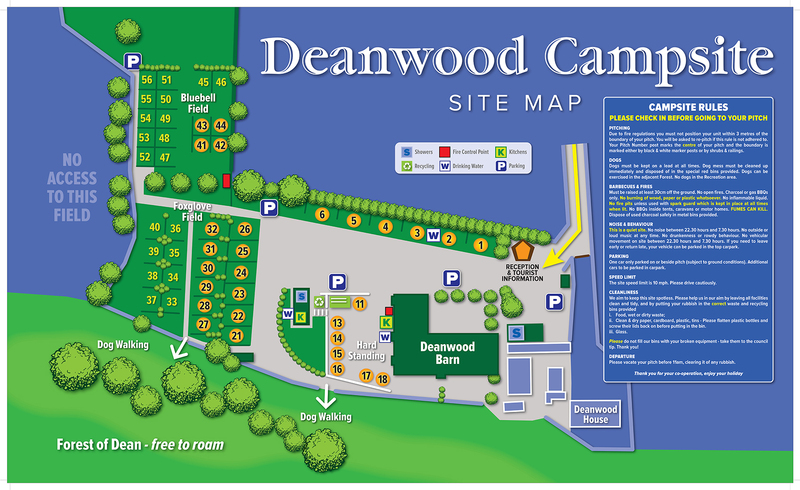 In 2016, Deanwood Campsite re-opened as an 18+ site. Just to clarify, 'adult' does not mean nudist!!! but allows you the bliss of escaping from children, delightful and entertaining as they may be, for a little while. Deanwood Campsite prides itself on being a quiet peaceful site where our guests can relax, unwind, enjoy the stunning setting and the sights and sounds of the wildlife in the Forest of Dean, Gloucestershire. Woodland paths border Deanwood Caravan and Campsite where deer are often seen in the early morning and at dusk. Sometimes the elusive white deer is also spotted by our guests. 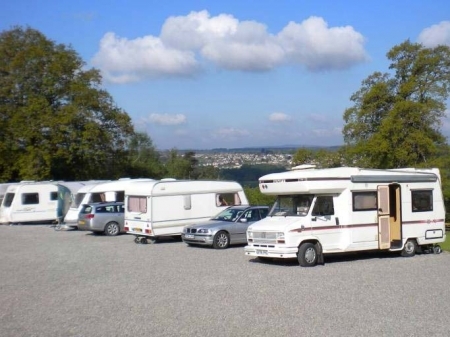 The campsite slopes gently to the west, giving panoramic views across the Lyd Valley and the Forest of Dean to the Black Mountains and the Brecon Beacons beyond. Well behaved dogs are welcome on Deanwood Caravan and Campsite as long as their owners are also well behaved! There are gates leading from Foxglove Field and from near the Motor Home area directly into the Forest of Dean where you can exercise your dog. The Forest of Dean is very popular with dogs and their owners with miles of footpaths waiting to be sniffed out and many local pubs and restaurants are dog-friendly. Please keep your dog on a short lead or tethered whilst on site and pick up your dog's mess immediately, disposing of it in the bins provided. We also now have an enclosed field where you can exercise your dog off the lead. There are a wealth of attractions and activities on offer in the Forest of Dean, Gloucestershire, all within approximately a 20 minute drive. Visit castles and historic houses, wine taste and explore a vineyard, kayak on the River Wye, go underground at Clearwell Caves, visit Symonds Yat Butterfly Zoo and Maze, explore Puzzlewood where Star Wars, Merlin, Dr Who etc. were filmed, hire a bike for a leisurely cycle ride along traffic-free cycle paths or tackle serious downhill mountain bike trails ... the list is endless! The Deanwood Barn Sports Hall can be hired in summer months to enjoy a game of badminton, table tennis and table football. Deanwood Caravan and Campsite guests enjoy the modern heated shower blocks, with free hot showers, which are regularly cleaned keeping them in tip-top condition. There is also a shower & toilet room with facilities for the disabled . The Washing-Up Room has free hot water to the sink, and under the work surface are a washing machine, a tumble drier and a freezer for icepacks. The campsite has an easily accessible drive-over grey water discharge point and a convenient carousel emptying point. At Deanwood Campsite in the Forest of Dean everything has been thought of to make your holiday experience here one that you will want to repeat. Scroll down to the bottom of the page for our site map.